When Begum Fazilatunnesa was only three and Sheikh Mujib was 13, their marriage had been fixed by elders in the family. Interestingly, they were both cousins. When Begum’s father passed away when she was 5, Sheikh Abdul Hamid (grandfather to both Fazilatunnesa and Sheikh Mujib) asked his son Sheikh Lutfar Rahman to get his son Sheikh Mujib married to Begum Fazilatunnesa. They got married in the year 1938 when Mujib was 18 years old. There was a 10 year difference between them. The couple later gave birth to two daughters, Sheikh Hasina and Sheikh Rehana, as well as three sons, Sheikh Kamal, Sheikh Jamal and Sheikh Russel.His daughter Sheikh Hasina is the prime minister of Bangladesh. His larger than life persona was matched with his confidence and charisma, both making him stand out among men as well as international personalities such as Fidel Castro, Marshal Tito, Henry Kissinger, Andre Marlaux, Curt Waldheim, Ne Win, Colonel Gaddafi, Motubo, and even Zulfikar Ali Bhutto. 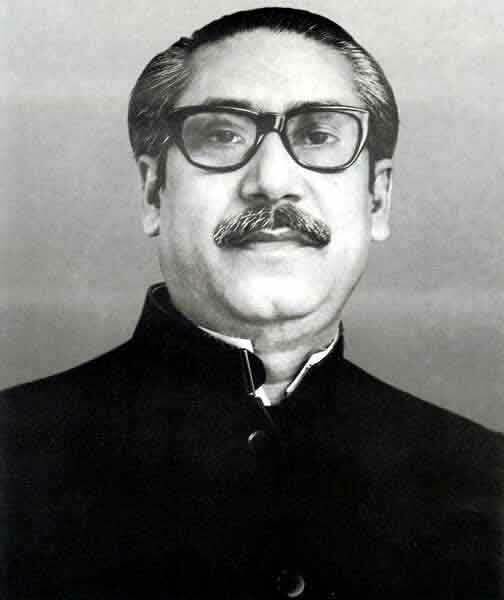 Bangabandhu Sheikh Mujib may not have distinguished himself in his studies, but was certainly liked by his teachers and peers. Growing up in a rural setting, he had a love for sports and outdoor activities. “My father grew up rural – amid rivers, trees, birdsong. He flourished in the free atmosphere inspired by his grandparents. He swam in the river, played in the fields, bathed in the rains, caught fish and watched out for birds’ nests. He was lanky, yet played football,” reads an excerpt from Sheikh Hasina’s essay on Sheikh Mujibur Rahman titled Mujibur Rahman for a special section on Asiaweek magazine’s June 12 (1998 edition). The special section contained a collection of essays on the leaders, fighters, fathers and martyrs of new Asia. The English-language news magazine focused on Asia, and was published weekly by Asiaweek Limited, a subsidiary of Time Inc.